S1 R aka M306; SNP discovery and data documenting the phylogenetic position were privately communicated to the Y-DNA ISOGG Working Group. S3 R1b1c SNP discovery and data documenting the phylogenetic position were privately communicated to the Y-DNA ISOGG Working Group. S10 R1b1c SNP discovery and data documenting the phylogenetic position were privately communicated to the Y-DNA ISOGG Working Group. S13 R1b1c SNP discovery and data documenting the phylogenetic position were privately communicated to the Y-DNA ISOGG Working Group. S17 R1b1c SNP discovery and data documenting the phylogenetic position were privately communicated to the Y-DNA ISOGG Working Group. S23 I1b2 Ethnoancestry (Genealogy-DNA Rootsweb List, 18 November 2005); SNP discovery and data documenting the phylogenetic position were privately communicated to the ISOGG Y-DNA Working Group. S24 I1b2a Ethnoancestry (Genealogy-DNA Rootsweb List, 18 November 2005); SNP discovery and data documenting the phylogenetic position were privately communicated to the ISOGG Y-DNA Working Group. S25 P SNP discovery and data documenting the phylogenetic position were privately communicated to the ISOGG Y-DNA Working Group. S26 R1b1c9a aka L1, aka Null DYS439; SNP discovery and data documenting the phylogenetic position were privately communicated to the ISOGG Y-DNA Working Group. 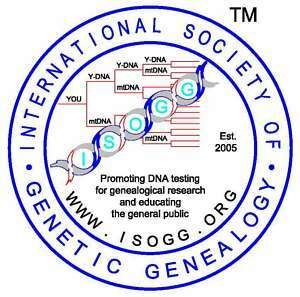 S30 I1b2 Ethnoancestry (Genealogy-DNA Rootsweb List, 11 January 2006); SNP discovery and data documenting the phylogenetic position were privately communicated to the ISOGG Y-DNA Working Group. S31 I1b Ethnoancestry (Genealogy-DNA Rootsweb List, 11 January 2006); SNP discovery and data documenting the phylogenetic position were privately communicated to the ISOGG Y-DNA Working Group. S32 I1b2 Ethnoancestry (Genealogy-DNA Rootsweb List, 11 January 2006); SNP discovery and data documenting the phylogenetic position were privately communicated to the ISOGG Y-DNA Working Group. S33 I1b2 Ethnoancestry (Genealogy-DNA Rootsweb List, 11 January 2006); SNP discovery and data documenting the phylogenetic position were privately communicated to the ISOGG Y-DNA Working Group. S44 R1b1c10 private; SNP discovery and data documenting the phylogenetic position were privately communicated to the ISOGG Y-DNA Working Group. S50 R1b1c private; SNP discovery and data documenting the phylogenetic position were privately communicated to the ISOGG Y-DNA Working Group. S68 R1b1c11 SNP discovery and data documenting the phylogenetic position were privately communicated to the ISOGG Y-DNA Working Group. S69 R (Private SNPs) private; SNP discovery and data documenting the phylogenetic position were privately communicated to the ISOGG Y-DNA Working Group. Added rs numbers to M46, M51, M61, M130, M176, M235, RPS4Y, SRY464, Tat and added information on M235 on 12 January 2007. Removed reference to Athey paper for P17 on 8 June 2007. Removed reference to Underhill et al (2001) for M227 on 8 June 2007. M72 reclassified as I1a1a (formerly I1a3) on 8 June 2007. Added Bortolini et al (2003) and Derenko et al (2006) on 8 June 2007. Made correction on notations for P51 on 8 June 2007. Added S62, S73, S74, S65, S66, S68 on 8 June 2007. Added V36 and V65 on 17 June 2007. Added Reguiro et al (2006) to M12, M47, M67, M92, M102, M172, M241, M285, M377, M410, M419, and DYS413≤18 on 25 July 2007. Changed subclades for M224 and V32 on 25 July 2007. Added U1, U2, U3, U5, U6, U7, U8, U12, U13, U16, and U17 on 17 October 2007. M321 was listed as in J2e1b1; corrected to J2e1a3 on 17 October 2007. M262 was relisted to K2 on 17 October 2007. P78 was relisted to I1b2a3 on 17 October 2007. Added M405 and M467 on 17 October 2007. SRY1532 has been split into SRY1532.1 in BR and SRY1532.2 in R1a for clarification on 17 October 2007. Added Myers et al (2007) to M267, M405 and M467 on 17 October 2007. Added Mona et al (2007) to M9, M38, M119, M122, M254, and P34 on 17 October 2007. Added Chandrasekar et al (2007) to YAP on 17 October 2007. Added Tan et al (2007) to M6, M95, and M134 on 17 October 2007. Added S69; placed U7 in G (not G2c) and placed U8 in G2c (not G) on 17 October 2007. Placed V27 in E3b1a2a rather than in E3b1a3b on 17 October 2007. Added Sims et al (2007) to M222; added S25 on 31 October 2007.